An extension of the rule for roughing the passer, a new rule in 2014 prohibits the defense from making forcible contact at the knee or below to an opponent who is in a passing posture. It is designed to eliminate knee injuries on plays where the defensive player forcibly drives a shoulder, helmet or forearm into the lower leg of the passer. This rule is not intended to prevent the defense from making a legitimate wrap-up tackle in which the contact is at or below the knee. Beginning in 2014, the referee will ask the team to change into legal jerseys before the game begins. If the team does not change, it will be charged with a timeout. The same opportunity will be offered during the time between the first and second quarters, at halftime and at the beginning of the fourth quarter, and again a timeout will be charged each time the team does not comply. This means that a team could potentially burn four of its allotted six timeouts for the game because of the illegal jerseys. This year college football officials are being asked to pay special attention to two areas of the game that are of concern to the rules committee and to other stakeholders: management of team personnel on the sidelines and the sportsmanlike behavior of players. Player behavior is also becoming an issue as unsportsmanlike conduct is starting to drift back into the game. Good sportsmanship and respect for the opponent are firmly entrenched characteristics of college football that must be maintained. Spontaneous enthusiasm and positive celebration are encouraged, but when players extend this into self-promotion and taunting of the opponent, officials will be firm about calling unsportsmanlike conduct fouls. Some of these acts, such as the “throat slash” or vulgar behavior, are automatic fouls. Actions of this ilk have no place in our game, and officials are instructed to throw the flag when these occur. The game and its image are advanced and strengthened when everyone involved conducts themselves in a manner that embraces good sportsmanship. The CFO functions as the national professional organization for all football officials who work games at the collegiate level, and the organization held its annual winter meeting of conference coordinators for football officials in late January for the second consecutive year at the NFF headquarters in Irving, Texas. The NCAA Football Rules Committee subsequently adopted the CFO’s recommendations to create a safer environment for football student-athletes. 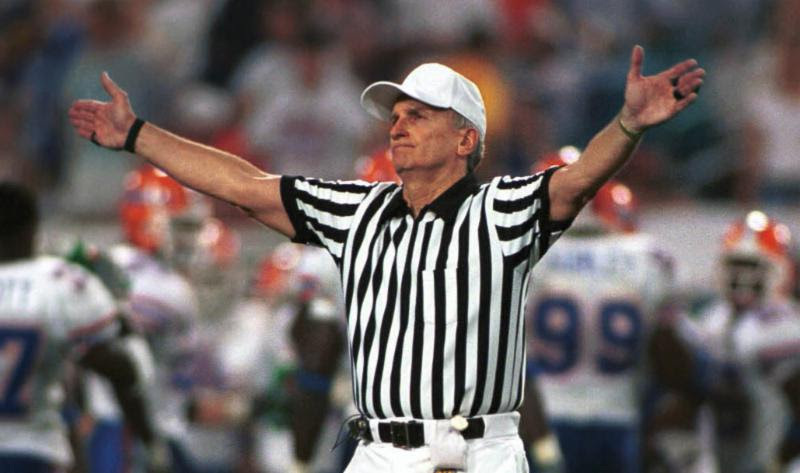 The NFF has partnered with Rogers Redding, the national coordinator of College Football Officiating, to help generate awareness for the major rule changes for the 2014 college football season. Founded in 1947 with early leadership from General Douglas MacArthur, legendary Army coach Earl “Red” Blaik and immortal journalist Grantland Rice, The National Football Foundation & College Hall of Fame is a non-profit educational organization that runs programs designed to use the power of amateur football in developing scholarship, citizenship and athletic achievement in young people. With 120 chapters and 12,000 members nationwide, NFF programs include the College Football Hall of Fame in Atlanta, the NFF Leadership Hall of Fame, the NFF Scholar-Athlete Awards presented by Fidelity Investments, the NFF High School Showcases, the NFF Hampshire Honor Society, the NFF Faculty Salute Initiative presented by Fidelity Investments, the NFF National Scholar-Athlete Alumni Association, and scholarships of more than $1.3 million for college and high school scholar-athletes. The NFF also collaborates with the Football Writers Association of America (FWAA) to release the FWAA-NFF Grantland Rice Super 16 Poll; presents the William V. Campbell Trophy endowed by HealthSouth and hosted at the New York Athletic Club; and bestows several other major awards at the NFF Annual Awards Dinner. NFF corporate partners include the Allstate Sugar Bowl, Fidelity Investments, Herff Jones, PrimeSport, the Sports Business Journal, and Under Armour. Learn more atwww.footballfoundation.org.